I've wanted to blog about being commissioned to do the layout and design Blood Eagle for some some time. Leading up to and during the design work obviously I couldn't say anything and then my new job came along and Real Life took over. Now I'm catching up on my blogging so I can do a little shameless self-promotion... Blood Eagle is my second major commission and I couldn't be happier with how it turned out. 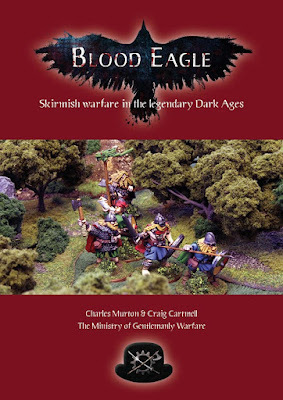 Blood Eagle - Skirmish gaming in the legendary Dark Ages is yet another wonderful offering from the talented lads Craig and Charles from The Ministry of Gentlemanly Warfare (of both Daishō and In Her Majesty's Name fame). Blood Eagle is the second self-published venture by the lads and I was lucky enough to be the chap commissioned to help them bring their material into the real world, thanks largely to Simon Miller whom I worked with on To The Strongest! and who apparently gave me a rather decent reference. Thanks Simon! I have to say working with Charles and Craig was both a privilege and a pleasure. They are clearly both heavily invested in their games and possess a serious wealth of knowledge on game design. Coupled with a love of the Dark Ages period and particularly the legendary aspect of it and the end product was always going to be something special. 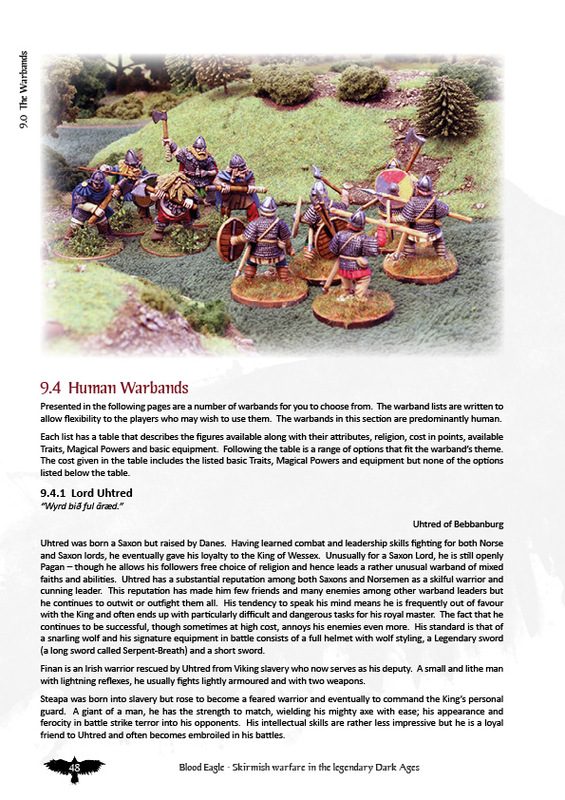 The rules themselves run to 100 full colour pages and there's loads of glorious eye candy from a number of gamers. One of my pics even found it's way in there - see if you can work out which one if you pick up a copy. 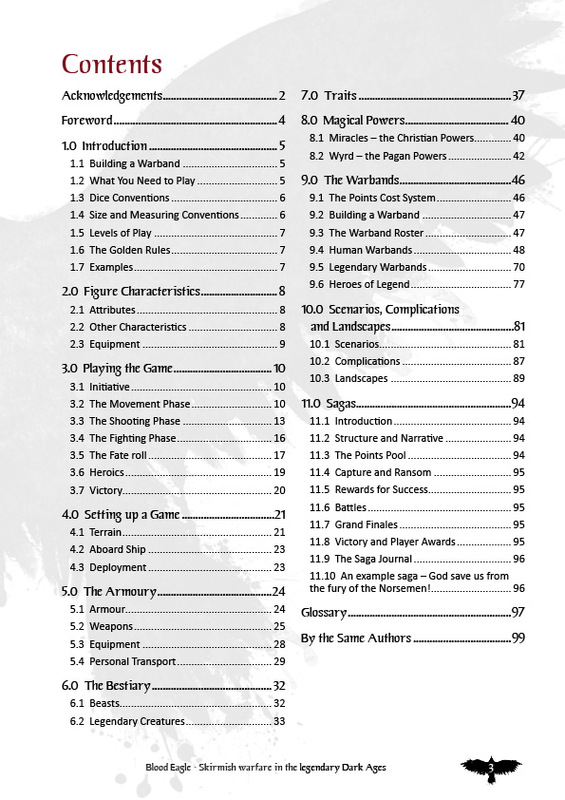 There's an extensive table of contents and the rules are heavily cross-referenced throughout as well. Detailed examples of play make learning the game easy to do and the numerous quotes add real flavour and get you in the right mind set. 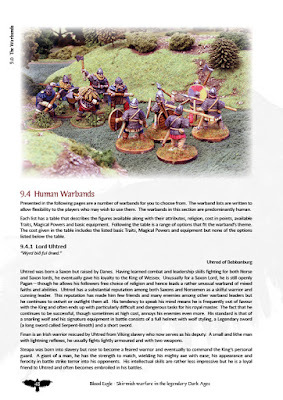 Finally, there's a huge section on on warbands which includes both fictional and historical personalities and hanger's on. All in all it's a corker of a publication! Since the rules have become available I've been curious too see what the gaming community in general thought of the design aspect. You want to know all the thought and effort you put in has achieved what you set out to do and made people happy right? 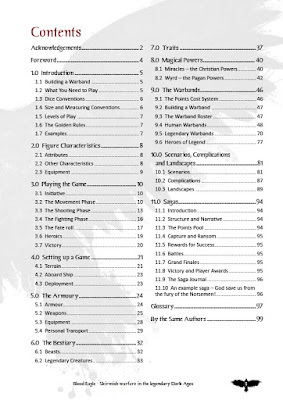 Design is especially important in games because it supports your learning of the rules and then should fade into the background and not detract from enjoyment of the book. 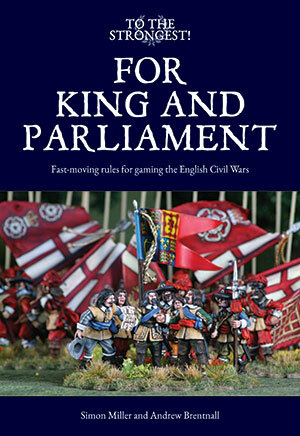 You can pick up your own copy from North Star Military Figures for a measly GBP14.95. If you'd like help with your project small or large have a look at what I can offer. Good shooting Tex - it's nice to have the feeling of a job well done. Is graphic design your day job? The layout and presentation of TtS certainly is first rate! Not too shabby on the design and layout there, Mr Mills, and getting some good reviews as well! Something tells me I'll be ordering a copy for myself in the not-too-distant future. Thanks Craig, very much appreciated! Congrats on a job well done mate! And glad to see you back in the saddle! Thanks Sander. It's great to be back in the swing of things. Jolly well done you, the rules appear to have been met with some considerable success and it must be such a buzz to be part of something like this. Thanks Sir Michael. It was great fun and I'm pleased people like it so much. A superb job. Crisp and uncluttered, easy-to-read and reference with an intuitive layout. And then, of course, there are the evocative pics of some lovely minis! Thanks Gordon. Yes, there are some gorgeous pics in the book! Everything Gordon said above! A fine example of how a set of rules should be presented. 2 publications? Big high five to you, Millsy! You help make our great hobby go. Now I have to find the rules and see your handiwork first hand! Well done! Cheers Paul. I couldn't agree more mate. Awesome. Any rule book that includes Uhtred, Finian and Steapa must be good.